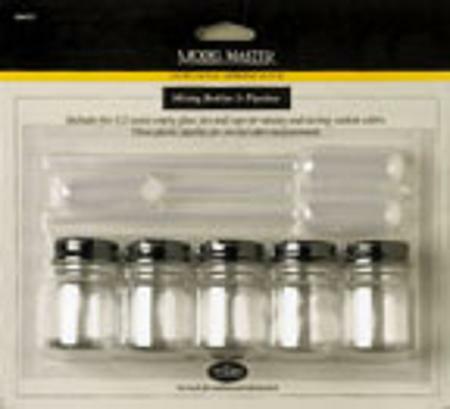 This is the Model Master Mixing Bottle & Pipette Set from Testors. Retail $9.15 SAVE 29% ! These are great little jars to keep custom mixes in, or to use for small color runs with easy clean up. The jars are twice the size of the small Testors jars. (Duh: 1/2 oz vs 1/4 oz) The lids seal tightly and they give you small round stickers to label the lids with. I just use a cut down Post It for easy switcharoos. The pipettes are a thin plastic. They work well. I use them for acrylics only for easy cleanup. Have not used them for enamels. I don&apos;t think they would clean up as easily, but I could be wrong. Jars for mixing and storing paints. Pipettes for accurate paint measurement when mixing. "Good set of five empty jars"
Perfect size jars for mixing and storing just a little bit of paint. Seems like I never need to store that much. The package includes five which is a great deal for the price.